“When people ask me what a flex shaft can do, I think the better question is, ‘What can’t it do? 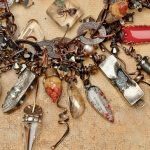 '” I have to agree with metalsmithing expert Andy Cooperman’s words. 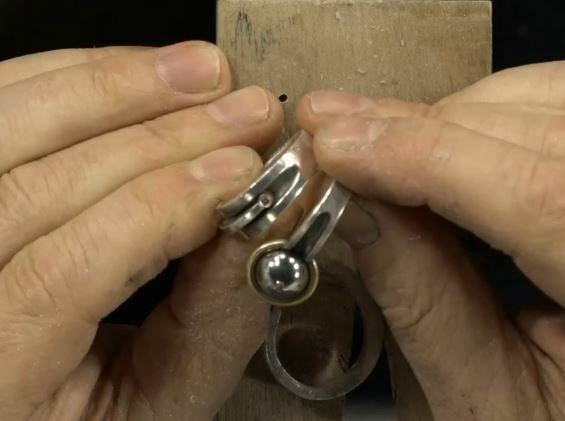 In his two-part video, Master the Jewelry Flex Shaft, Vol 1 and 2, he shares so many great tips. And every time I read an article or watch a video about using a flex shaft for metalsmithing and jewelry making, I learn a new way to use one. Is there no end to what this tool can do? Cutting, drilling, piercing, texturing, carving, polishing, filing, riveting, faceting, lathing, engraving, and on and on. This one hard-working tool offers so many metalsmithing capabilities. I bet there are a lot of things it can do that you never imagined. For example . . .
Have you ever been drilling a little too impatiently, a little too fast, and had your drill bit break off in the metal you’re drilling? The way drill bits are made, with those spiral grooves, they’re nearly impossible to get out of your work when you’re metalsmithing. 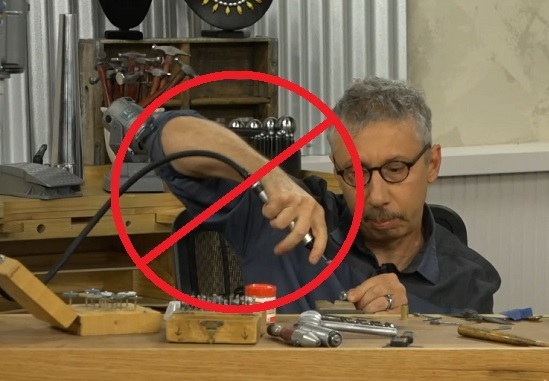 But I learned how to do it, with this awesome tip for removing drill bits from metal, from Andy’s new flex shaft video, Master the Jewelry Flex Shaft with Andy Cooperman. Your first instinct, Andy says, might be to drill into it with another drill bit, but that’s not the best way and you might end up with two broken drill bits. Instead, get some alum in the pickling section of the grocery store. 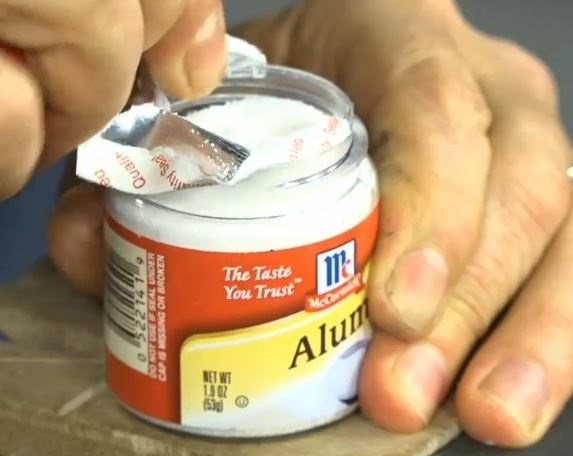 Make a solution of alum and water, heating in the microwave and adding more alum until it’s super saturated. You can also do it on the stovetop. Submerge your ring or whatever metal the drill bit is stuck in, and wait about 30 minutes. Andy says the drill bit will dissolve enough that you can get it out. You can also use hot pickle–the same as you use for soldering and metalsmithing–which he says is even more aggressive. “You’ll have a little bit of copper plating maybe,” he says, “but 30 minutes ago you had a drill bit stuck in there.” Great tip! Andy hangs his flex shaft about 24″ above the bench, not the up to 40″ he says is often recommended. This allows for a more natural, horizontal angle and comfortable grip on the handpiece for metalsmithing. 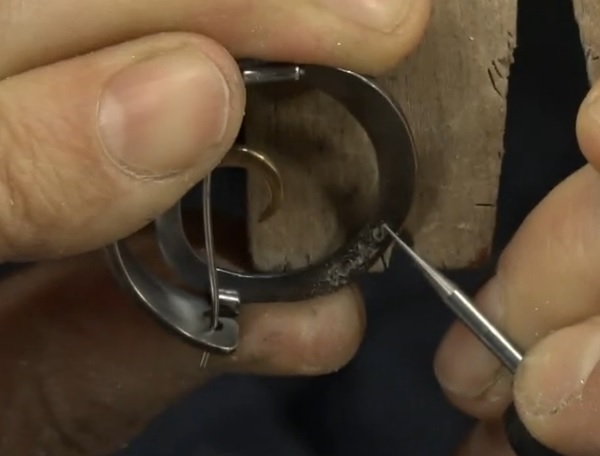 Using a ball bur and flex shaft to easily carve out concave grooves in metal, Andy created these rings that are completely fabricated, not cast. 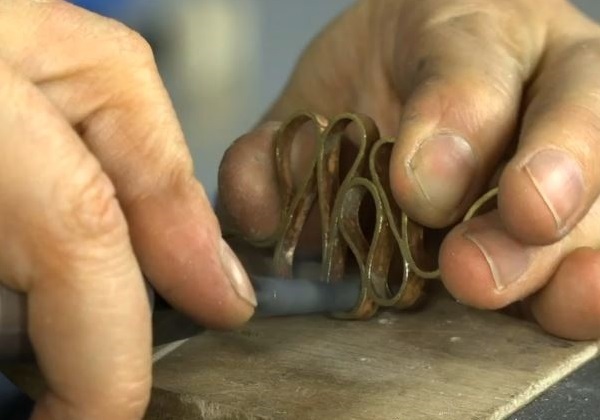 He creates channels in the metal that would be very time-consuming, if not impossible, to do with a file or any other metalsmithing techniques. 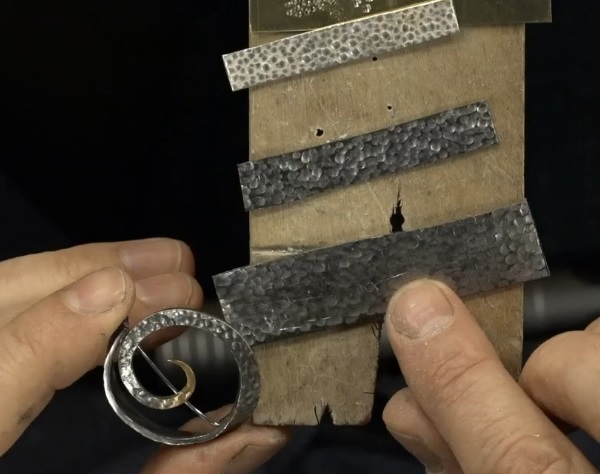 After using a ball bur to carve divot texture into a piece of steel or brass, Andy says you can use the resulting piece as a texture plate in a rolling mill to create an alligator-skin texture on silver, as shown above. You can carve or create any texture to make your own texture plates for use with a rolling mill, metal clay, and other metalsmithing techniques. Using a ball bur with a ball that’s so small, people can hardly believe it’s there, Andy even uses a flex shaft to engrave and sign his name on his work. For those of you who love to draw, you’re welcome! How fun would that be? To just sit down and draw and sketch on metal using the tiniest ball bur imaginable. Talk about one-of-a-kind work! And I know you know how much value an original artist’s signature adds to their work. 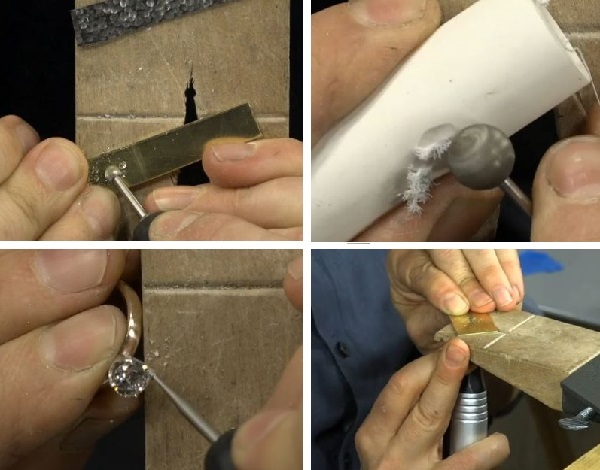 Learn more common and uncommon ways to use a flex shaft for metalsmithing techniques with metal jewelry expert Andy Cooperman. Join him in his fast-paced flex shaft videos, Master the Jewelry Flex Shaft, Vol. 1: Burs, Mandrels, Sanding/Grinding, Rubberized Abrasives & Finishing, and Vol. 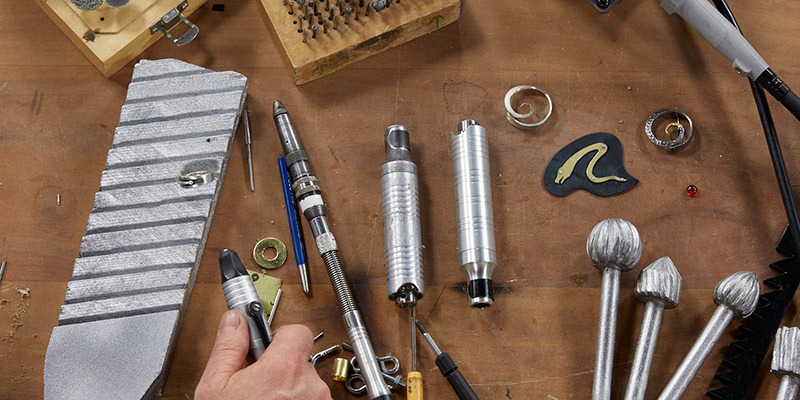 2: Hammer Handpieces, Special Tips & Tricks. I say fast-paced because Andy shows example after example of how to use a flex shaft on metal, wood, wax, and other materials; to carve, file, facet, texture, and other techniques. It’s the most info-packed video I’ve ever seen. And I’m certain that whether you’ve never touched a flex shaft or have been using one for years, you’ll learn from Andy in this two-part video! For more tips from Andy, read From Drill Bits to Buffing Wheels: Flex Shaft Accessories for All Your Metalsmithing Tasks. Learn all the ways to use a flex shaft in your studio!